My Inspiration and my best CEO ever, Steve Jobs has resigned from Apple yesterday 24th August 2011. It a little bit sad to see him step over from the CEO but I think it’s the best decision to give opportunity to his successor Tim Cook as the new CEO of Apple . Then best part I feel about the news is that he will still remain in Apple as the Chairman of Board. I think this line makes everyone feel good and secure about the future of Apple . Now it’s time to look where will Apple lead to with new leadership. My Best wishes for the new CEO, Tim Cook . I look forward for better product, leadership and inspiration. 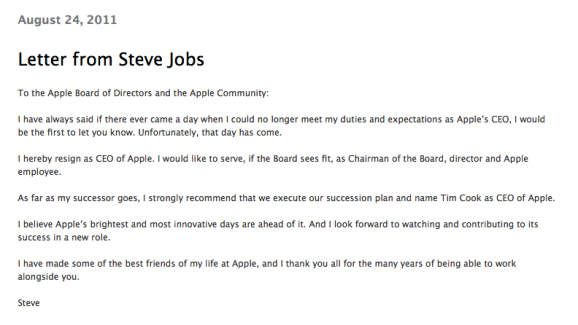 Click here to read the Apple Press Info of Steve Jobs Resigns as CEO of Apple. Click Here to read Bios of Tim Cook. This entry was posted in Business News, Human Resources, Tech News by sakinshrestha. Bookmark the permalink.